During labor, the fetus assumes positions and attitudes that are determined in part by the configuration of the mother’s pelvis. The “true” pelvis includes the inlet, the midpelvis, and the outlet. The anterior wall at the pubic symphysis measures approximately 5 cm, and the posterior wall measures approximately 10 cm. The pelvic inlet is bounded laterally by the iliopectineal lines, which can be traced anteriorly along the pectineal eminence and pubic crest to the symphysis. The posterior boundary is composed of the sacrum at the level of the iliopectineal lines. The anteroposterior diameter (obstetric conjugate) is the shortest distance between the sacral promontory and the pubic symphysis. The inlet usually is considered to be contracted if the obstetric conjugate is less than 10 cm or the greatest transverse diameter is less than 12 cm. When both diameters are contracted, the incidence of dystocia is much greater than when only one diameter is contracted. The midpelvis is bounded anteriorly by the posterior aspect of the symphysis and pubis and posteriorly by the sacrum at the level of S3 or S4. The lateral boundary is the pelvic sidewalls and ischial spines. The distance between the ischial spines is usually the smallest diameter of the pelvis, typically measuring 10 cm or more. The anteroposterior diameter of the midpelvis, which runs from the inferior aspect of the pubic symphysis to the sacral hollow at the level of the ischial spines, averages 11.5 cm or more. Midpelvic contraction should be suspected whenever the interspinous diameter is less than 10 cm. When the diameter is less than 9 cm, the midpelvis is considered definitely contracted. Midpelvic contraction is more common than inlet contraction. The pelvic outlet is composed of two triangular areas that share the same base but are not in the same plane. The anterior triangle is formed by the pubic arch. The apex of the posterior triangle is the tip of the sacrum, and the sides are the sacral sciatic ligaments and ischial tuberosities. The anteroposterior diameter, from the inferior edge of the pubic symphysis to the tip of the sacrum, usually measures approximately 11.5 cm. The transverse diameter, the distance between the inner edges of the ischial tuberosities, measures approximately 10 cm. It is rare to find outlet contraction without midplane contraction. Of the four types of pelves, gynecoid, android, anthropoid, and platypelloid, the gynecoid pelvis is most optimal for normal delivery. Other abnormalities also may affect the bony pelvis. Kyphosis, if it involves the lumbar area, may be associated with a typically funnel-shaped pelvis, which leads to late arrest of labor. Scoliosis, which involves the lower region of the spine, may produce an irregular inlet, leading to obstructed labor. The pelvis usually is not contracted in cases of unilateral lameness. With bilateral lameness, the pelvis is wide and short, but most women are able to deliver vaginally. In poliomyelitis, now extremely rare, the pelvis may be asymmetric, but most patients can deliver vaginally. In dwarfism, cesarean delivery is generally the rule because of marked fetopelvic disproportion. Cesarean sections occur more frequently in women with a history of a pelvic fracture, especially bilateral fracture of the pubic rami, before pregnancy.1 In the aforementioned uncommon pelvic abnormalities, it may be helpful to assess the pelvis further with imaging pelvimetry. Soft tissue abnormalities in the pelvis occasionally can result in dystocia. Uterine myomas are the most common pelvic masses associated with dystocia. They may obstruct the birth canal or cause malpresentation of the fetus. Other possible causes of upper genital tract dystocia include ovarian tumors, bladder distention, a pelvic kidney, excess adipose tissue, uterine malposition, and cervical stenosis or neoplasm. Lower genital tract dystocia can be caused by partial vaginal or vulvar atresia, severe edema or inflammation, Bartholin’s or Gartner’s duct cysts, vaginal septum, large condylomata, hematomas, and neoplasms. Clinical estimation of the adequacy of the pelvis can alert the clinician to the possible risk of pelvic dystocia. A clinically small pelvis is associated with a 2.5-fold increase in primary cesarean section.2 The outcome of labor depends more on the actual pelvic diameters than the shape and type of pelvis. Several pelvic diameters can be assessed clinically, including the diagonal conjugate (measured from the inferior edge of the pubic symphysis to the sacral promontory), prominence of the ischial spines, convergence of pelvic sidewalls, angle of the subpubic arch, and sacral curvature. In general, suspicion of a contracted pelvis is increased with the conditions listed in Table 1. The size, presentation, and position of the fetus are important factors in the conduct of labor. Pelvic size and configuration and excessive soft tissue may influence the fetal position and presentation. Although the macrosomic infant is at greater risk for dystocia, most cases of abnormal labor occur among fetuses weighing less than 4000 g.
The biparietal diameter (BPD), the smallest transverse dimension of the fetal skull, averages approximately 9.5–9.8 cm among term fetuses. The shortest anteroposterior dimension is the suboccipitobregmatic diameter, which also averages approximately 9.5 cm. The fetal head can overcome minor degrees of pelvic contracture by molding. The bones of the skull overlap at major suture lines, which can decrease the BPD by 0.5 cm without fetal injury. Severe molding may lead to tentorial tears and intracranial hemorrhage. Prolonged, severe pressure between the fetus and birth canal may lead to fetal scalp necrosis or skull fracture. The mother may develop a vesicovaginal, vesicocervical, or rectovaginal fistula. Other risks of fetopelvic disproportion include cord prolapse, prolonged labor with an increase in maternal and fetal infections, uterine rupture, postpartum hemorrhage, abnormal presentation or position, and maternal and neonatal trauma. Fetal malpresentation may be the result of or the cause of dystocia. Nonvertex presentations should alert the clinician to the possibility of pelvic dystocia. In compound presentations, a fetal hand beside the head may be encouraged to withdraw by a gentle pinch. A fetal foot beside the head is more unusual; vaginal delivery still may be possible if the pelvis is adequate. Other than cases of extreme prematurity, the delivery of transverse lies require cesarean delivery. In a brow presentation, the partially extended head presents with the occipitomental diameter of 13.5 cm in the average term fetus. Brow presentations are associated with pelvic contraction, small or large fetuses, and nuchal masses. Two thirds spontaneously convert to either a face or an occipital presentation. Manual or forceps conversion is no longer advocated. Cesarean birth is recommended if the brow presentation persists except in cases of a small fetus. The fetal head is completely hyperextended in a face presentation. The incidence is about 1:600 deliveries. Associated factors include anencephaly and brow presentations. If the mentum (chin) persists posteriorly, cesarean delivery is necessary because the fetal neck cannot hyperextend further to accommodate the pelvic curve. A vaginal delivery is possible with mentum anterior presentations. Manual or forceps conversion of face presentations is no longer advocated. The occiput transverse position is normally transitory because of the process of internal rotation. Platypelloid and android pelves have narrow anteroposterior diameters, which may not allow normal rotation. If the transverse arrest is believed to be due to a contracted pelvis, cesarean delivery is necessary. If the pelvis is thought to be adequate, a forceps rotation may be attempted. Oxytocin may be of benefit in causes of transverse arrest, which include uterine inertia and compromise of the pelvic floor muscles. If the pelvis has a prominent sacral promontory, asynclitism may develop; the vertex does not orient the sagittal suture in the midplane of descent. Asynclitism of the fetal head may overcome small degrees of pelvic inlet contraction. In anterior asynclitism, in which the sagittal suture is nearer the sacrum, the outcome is more favorable than in posterior asynclitism, in which the sagittal suture is closer to the pubic symphysis. If the asynclitism does not overcome the contracted anteroposterior diameter, a deep transverse arrest results. With the common use of ultrasound, most anomalies capable of producing disproportion are diagnosed before the onset of labor. Hydrocephalus is a frequently encountered developmental abnormality that causes dystocia. A biparietal diameter greater than 120 mm has been associated with true cephalopelvic disproportion. If the fetus has a lethal condition, cerebrospinal fluid can be removed to allow a vaginal delivery; this is a rare procedure in modern obstetrics. Craniosynostosis, premature closure of the cranial sutures, may cause distortion but rarely leads to dystocia. Encephaloceles, which carry a poor prognosis, are usually fragile and may rupture during delivery. Potentially viable conjoined twins require delivery by cesarean section. Abdominal masses causing dystocia include hydrops fetalis, posterior urethral valves, Wilms’s tumor, polycystic kidneys, ovarian and hepatic tumors, and ascites. Ascitic fluid and other cystic masses can be drained percutaneously in labor to allow vaginal delivery. Ascitic fluid can reaccumulate rapidly, however. Meningomyeloceles, omphaloceles, and gastroschisis usually do not obstruct labor, but the optimal obstetric management of these conditions is controversial. A sudden inability to deliver the fetus beyond the abdomen can be due to an undiagnosed sacrococcygeal teratoma. In such cases, it may be possible to flex and deliver the legs to allow more room for the mass to deliver. Another option is resuscitation and stabilization of the infant on the perineum then replacement with cesarean delivery. There is no consistent definition of fetal macrosomia in the literature. The most commonly cited definition is birth weight greater than 4000 g. The incidence of birth weight greater than 4000 g has been increasing.5 Typically, fetuses weighing more than 4000 g account for nearly 10% and fetuses weighing 4500 g or more represent approximately 1% of all deliveries. Macrosomic infants have a threefold increase in morbidity.5, 6 They have an increased risk for shoulder dystocia, meconium aspiration, asphyxia, brachial plexus injury, placenta previa, traumatic midforceps, and fetopelvic disproportion. The head is larger than average but also more calcified, with less potential for molding. Size of the fetal trunk also may contribute to dystocia and mechanical problems at delivery. Labor abnormalities include arrest and protraction disorders and shoulder dystocia. The accurate estimation of fetal weight (EFW) is an elusive goal. An accurate EFW would be useful in making clinical decisions in the management of macrosomic fetuses regarding the prevention of shoulder dystocia, the use of oxytocin augmentation in abnormal labor, and the use of midforceps. Clinical EFW is by abdominal palpation and measurements of fundal height. Studies designed to evaluate the accuracy of clinical EFW consistently have reported a tendency to estimate toward the mean birth weight. Errors at the extremes of birth weight are especially undesirable because obstetric interventions are often most important among preterm and macrosomic fetuses. Most investigators also report that the duration of clinical experience does not improve accuracy in estimating fetal weight and great individual variability exists among examiners. The application of clinically estimated fetal weight to individual patients is difficult but may have its greatest utility in selecting cases to obtain an ultrasonographic EFW. The use of ultrasound to estimate fetal weight has improved greatly on and supplanted clinical estimation. Many investigators have published formulas for sonographically estimating fetal weight. Shepard and colleagues7 published EFW based on BPD and abdominal circumference. Probably the most commonly used formula was published by Hadlock and associates,8 which uses femur length and abdominal circumference. Since then, many studies have been performed using various sophisticated formulas; however, they have had minimal improvement in the accuracy of sonographic EFW. Similar to the tendency found in the clinical EFW, ultrasound predictions of birth weight tend to overestimate low-birth-weight infants and underestimate macrosomic infants. Many mathematical models using different fetal measurements have been tested to detect the macrosomic fetus. Comparisons are difficult because the studies use varying fetal parameters, statistics, populations, and definitions of macrosomia. Even with improvements in technology, ultrasonographic EFW has a variability of ± 15% and may be ± 20% with EFW greater than 4000 g. The use of ultrasonographic EFW should be tempered by other clinical parameters. The causes of purely dysfunctional dystocia, in which uterine contractility is inadequate in effecting dilation and descent, are not well understood. The perception of uterine contractions via abdominal palpation requires a pressure more than 10 mmHg above the resting pressure. External electronic monitoring consists of a tocodynamometer on the abdomen over the fundus. It can provide the frequency and an estimate of the duration of contractions but does not provide information concerning intensity and tone. Internal pressure monitoring is accomplished by transcervical insertion of an open-ended plastic cannula, which is filled with fluid and attached to a pressure transducer, or insertion of a disposable pressure transducer into the amniotic cavity after rupture of membranes. Internal intrauterine pressure monitoring provides estimates of resting uterine tone and the duration, frequency, and intensity of contractions. The term estimates is used because, with ruptured membranes, the uterus is not a closed fluid system; intrauterine pressures also vary according to the position of the patient. Information about the intensity and strength of uterine activity is most accurately provided by direct monitoring obtained with an intrauterine pressure catheter. Most commercially available systems include a stiff catheter guide that is inserted just beyond the fetal presenting part and no further. The pressure catheter is advanced into the uterine cavity, and the catheter guide is removed. The appropriate depth of insertion can be determined by a mark on the catheter that should be at the level of the introitus after insertion. The catheter should be inserted posterior to the fetal presenting part. If the presenting part is well engaged in the pelvis, posterior insertion may be impossible, and anterior insertion may be attempted. Lateral insertion is discouraged because lateral perforation may precipitate uterine artery compromise with its attendant complications, including broad-ligament hematoma. Currently available catheters interface with the fetal monitor via a manufacturer-specific reusable cable. The set-up and calibration process are straightforward, and most systems incorporate a lumen into the catheter to permit simultaneous monitoring of intrauterine pressure as well as amnioinfusion. Various commercial models of intrauterine pressure catheter are available, including the Intran™ from Utah Medical Products10 and the Koala™ from Clinical Innovations.11 Because the equipment for using the IUPCs is generally not transferable from one brand to another, labor and delivery units will usually purchase only one brand of intrauterine pressure catheters. When changing brands, introducing the new equipment to nurses, physicians and other patient care providers is vital. There are no head-to-head trials suggesting any brand of intrauterine pressure catheter is better than any other brand. Many investigators have developed objective measurements of uterine contractility; however, none have had wide clinical usage. The simplest estimate of uterine work is the Montevideo unit. Developed by Caldeyro-Barcia,12 the Montevideo unit is the peak intensity above resting pressure multiplied by the number of contractions in a 10-minute time interval. Normal labor encompasses a wide range of uterine work – 95–395 Montevideo units.13 The Alexandria unit is the Montevideo unit multiplied by the average duration per contraction in a 10-minute interval. Work by investigators including Seitchik and Chatkoff14 and Steer and coworkers15 has shown that the progress of labor is not related solely to uterine work, especially in cases of dysfunctional labor. The total uterine work required to achieve dilation and descent reflects the amount of resistance that must be overcome. This resistance varies greatly among individuals, although dilation in multiparas requires less work than nulliparas. Although it is of interest, the objective quantitation of uterine activity at present has limited ability to aid in the management of labor. The same quality and quantity of contractions in a normal labor also may be seen with an abnormal labor in a different patient. Functional dystocia has been associated with two different types of abnormal contraction patterns. A hypertonic pattern typically has elevated resting pressures, increased contraction frequency, and decreased coordination, as well as a delayed fall to baseline uterine tone.16 This pattern is seen more often with fetal malpresentation and uterine overdistention. Oxytocin generally has not been recommended but occasionally has been shown to convert this pattern to effective labor. Hypotonic uterine dysfunction is more common and frequently responds to oxytocin. The contractions are synchronous but weak or infrequent or both. With primary dysfunction, it is hypothesized that contractions were never normally established. With secondary dysfunction, it is suggested that contractions were once adequate and became weaker as labor progressed, usually after 4 cm dilation. Absolute fetopelvic disproportion is uncommon, but the performance of cesarean delivery for that indication is common. It is assumed that the physician factor is significant in the diagnosis of dystocia. Physicians may be influenced by the patient’s attitude, the time of day, anesthesia support, the medicolegal climate, and their own training and experience. The patient’s level of anxiety and pain tolerance also may influence the character and duration of labor. Epidural anesthesia may cause a transient decrease in contractility for 10–30 minutes. This effect is much more pronounced if anesthesia is given in the latent phase or with fetopelvic disproportion or malposition. The action of voluntary muscles in correction of malposition may be impaired. Because epidural anesthesia is associated with a prolongation of the second stage of labor, intervention is not recommended unless the duration of the second stage exceeds 3 hours with a regional anesthetic in a nulliparous or 2 hours in a parous parturient.18 An increase in malpresentations and instrumental deliveries has been reported with epidural anesthesia. In 1989, Thorp and colleagues19 reported a significantly increased frequency of oxytocin augmentation and incidence of cesarean section for dystocia among patients receiving epidural anesthesia compared with controls. The increased rate of cesarean delivery for dystocia was not explained by other potentially confounding variables, including gestational age, cervical dilation, use of oxytocin, and birth weight. Other randomized trials investigating early and late administration of epidural anesthesia have not shown an increase in the rate of cesarean delivery.20, 21, 22, 23, 24. The latent phase of labor is particularly sensitive to narcotics. Although active labor is considerably less sensitive than in the latent phase, heavy sedation may slow dilation and increase the chance of protraction and arrest of dilation. Inhalation agents also have a wide range of effects that are dose dependent. Nitrous oxide has no effect on contractions, but halothane and other halogenated agents are strongly inhibitory. Intravenous nitroglycerin (in increments of 50 μg) results in rapid and profound uterine relaxation. Halothane and nitroglycerin can be used to relax the uterus to facilitate internal podalic version of a second twin, delivery of entrapped breech head, or manual removal of the placenta. The use of these agents can be associated with postpartum hemorrhage, however. There is a close relationship between the cervical score and onset of spontaneous labor. The state of the cervix may reflect myometrial sensitivity to oxytocin. It is possible that the promotion of cervical ripening may increase myometrial sensitivity and soften the cervix. Many agents have been investigated and found to induce cervical ripening with varying success, including estradiol and relaxin gels, Foley catheters, Laminaria tents, and prostaglandin E2 and F2α by various routes. Other newer induction agents, such as misoprostol, a prostaglandin E1 analogue, may cause cervical ripening and labor induction and stimulation. Oxytocin is an octapeptide that is synthesized in the hypothalamus and transported to axonal terminals in the posterior pituitary gland. Wide variability exists regarding reported maternal plasma concentrations of oxytocin during pregnancy and spontaneous labor. In addition to a tonic baseline release, oxytocin is released in pulses occurring at 3- to 5-minute intervals during normal labor, and fetal transfer of oxytocin to the maternal side may be an important physiologic source.31 Most investigators report a gradual rise in plasma oxytocin levels throughout gestation with a peak during the second stage of labor. Human myometrial oxytocin receptors, which peak in early spontaneous labor, seem to contribute to the initiation of uterine contractions. Receptor concentration is probably the major determinant controlling uterine response to either endogenous or exogenous oxytocin. 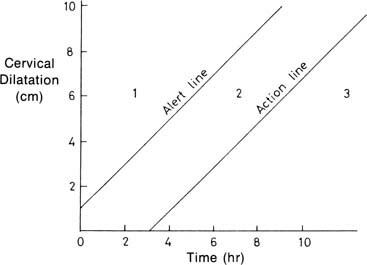 In vivo studies determined that the interval to reach a steady-state concentration of oxytocin in plasma (and maximal response) is 40–60 minutes after initiating or altering the infusion. The in vivo half-life of oxytocin is approximately 10–15 minutes. Studies of plasma oxytocin levels during continuous intravenous infusion show first-order saturation kinetics, with a progressive, linear, stepwise increase with each increase in the infusion rate. Pharmacologic data suggest that the infusion rate of oxytocin should start low (0.5–2 mU/min) with an increase arithmetically by 1–2 mU/min every 40–60 minutes. Because of varied response ranges in individuals secondary to differences in clearance rates and sensitivities, however, this rate of increase is inefficient in a significant portion of patients. Clinically, this variation resulted in an unacceptable delay in reaching an effective maintenance dose of oxytocin in 31% of patients who required greater than 4 mU/min. Seitchik and Castillo34, 35, 36 proposed, as a compromise, an increase in the infusion rate every 30 minutes with cautious observation for hyperstimulation. This proposal was tested in term nulliparas and multiparas with dysfunctional labor. When the oxytocin infusion rate was increased at less than 30-minute intervals, there was a twofold increase in the frequency of discontinuing or decreasing the oxytocin infusion because of hyperstimulation or fetal distress. A short (less than 30 minutes) interval of rate increase also was shown to be the most important factor resulting in a higher maximum dose of oxytocin and an actual delay in delivery by an average of 3 hours. The preterm uterus is usually less sensitive to oxytocin than the term uterus and may require larger doses. Theobald and coworkers37 reported that a 2 mU/min infusion of oxytocin at 32 weeks’ gestation induced small contractions, but just before, during, or after spontaneous labor, regardless of gestational age, the uterus responded to 0.5 mU/min. At term, an oxytocin infusion rate of 2–8 mU/min is usually sufficient for the successful induction of labor.38 Doses of 5 mU/min or less have been found to improve vaginal delivery rates, improve 1-minute Apgar scores, and cause no hyperstimulation. A dose greater than 20 mU/min at term is rarely necessary. The higher the dose required to produce effective contractions, the less likely is success. Seitchik and Castillo34, 35, 36 found in oxytocin augmentation of labor that with an initial dose of 1 mU/min and an increase of 1 mU/min every 30 minutes until a dilation rate of 1 cm/h was reached, more than 90% of multiparas and 85% of nulliparas required less than 4 mU/min. Oxytocic effects on the myometrium include increased strength, velocity, and frequency of contractions and increased intrauterine resting pressure. After maximum efficiency is reached, further increases in oxytocin may result in excessive contraction frequency and increased baseline tone, resulting in decreased effectiveness of the contractions and the development of fetal distress. If the contraction pattern seems adequate (one every 3–4 minutes), but cervical dilation is inadequate, clinical experience indicates that occasionally a decrease in the oxytocin dose may improve efficacy. The uterine contractile pattern may provide an initial evaluation of response, but the quantitation of uterine activity is far from perfect in identifying hypocontractile labor, identifying excessive stimulation, or guiding oxytocin therapy. Because normal labor has wide variability in uterine activity within and between individuals, other criteria for titrating oxytocin also are recommended. Melmed and Evans39 reported that if the initial cervical dilation rate was at least 1 cm/h among spontaneously laboring nulliparas, 93% had a spontaneous vaginal delivery. In contrast, 67% required forceps or vacuum delivery or cesarean section if the cervical dilation rate was less than 1 cm/h. Proponents of “active management of labor” use a cervical dilation rate of 1 cm/h among nulliparas to guide their use of oxytocin. As described by O’Driscoll and associates,40 active management of labor included early routine amniotomy and oxytocin infusions starting at 6 mU/min with increases every 15 minutes up to 40 mU/min, for dilation rates less than 1 cm/h, provided that there was no fetal distress. Among 3106 nulliparas, the cesarean section rate for the diagnosis of dystocia was only 1.4%. Although some claim that this policy for oxytocin use might result in too many patients receiving oxytocin, evidence from clinical studies suggests that a 1 cm/h rate of dilation may serve as a useful guide to determine the most effective dose of oxytocin in induction or augmentation in nulliparous women. In the United States, this active management approach resulted in a shorter duration of labor but did not result in a decreased cesarean section rate. Especially in the nulliparous patient, fetal heart rate response provides a further, and perhaps more appropriate, basis for titration of oxytocin than does uterine contractility. Placental venous outflow has been shown to stop during contractions, but adequate exchange follows with good relaxation. Arterial inflow continues until pressures of 30–70 mmHg, then may stop completely. The fetus continues to extract oxygen from the intervillous blood but eventually may resort to anaerobic metabolism until oxygen is restored after the contraction. Uterine blood flow varies indirectly with resting pressure, frequency, intensity, and duration of contractions. There are wide variations in fetal reserve, but excessive uterine tone and frequency of contractions may lead to acidosis, distress, and fetal death, even in the normal fetus. If the intensity and frequency of contractions must be kept low to protect a fetus with “decreased reserve,” more contractions are needed, but it is possible that this patient still may deliver vaginally with careful titration of the oxytocin dose. If, during oxytocin induction or augmentation, excess uterine activity or fetal distress occurs, it may not be a pathologic state requiring immediate cesarean delivery. When a patient moves to the supine position, contractions may become more frequent but less intense. This position also may result in increased risk of fetal hypoxemia and less progress in cervical dilation. Placing the patient in a left lateral position may be the only corrective measure necessary for hyperstimulation and fetal distress. Additional measures include starting oxygen and decreasing or stopping the infusion of oxytocin. Decreasing the oxytocin dose, rather than stopping it, may correct the abnormal pattern and prevent an unwarranted delay in delivery. When restarting the oxytocin, we suggest decreasing the previous rate by at least half. It may be possible to decrease the dose of oxytocin when labor has been established. Continuation of oxytocin throughout delivery may decrease the risk for postpartum uterine atony. Monitoring of the fetal heart rate and uterine activity should begin before and continue throughout oxytocin induction or augmentation. This monitoring is vital in the current medicolegal climate and may assist in determining the most efficient dose of oxytocin. Accurate documentation of fetal heart tones, frequency and duration of contractions, and oxytocin rate also is recommended. In the preceding sections, the limitations of pelvimetry, EFW, and uterine contractility to predict dystocia were discussed. For clinical purposes, other means must be employed to identify dystocia. From a functional perspective, the only essential features of labor are cervical dilation and fetal descent. The assessment of labor on a functional rather than on an anatomic/physiologic basis was pioneered by Caldeyro-Barcia,12 who evaluated the number of uterine contractions necessary to effect delivery, and Friedman,32 who emphasized that the arbiter of labor progress was cervical dilation and fetal descent as a function of time. The process of normal labor was dissected and defined (Table 2). Specific abnormal labor patterns were related to causative factors, and specific management decisions based on the type of abnormality were proposed. Adapted from Dystocia and the augmentation of labor. ACOG Technical Bulletin No. 218, December 1995 (replaces no. 137, December 1989, and no. 157, July 1991). American College of Obstetricians and Gynecologists. Int J Gynaecol Obstet 53:73, 1996. In the 1950s, Friedman introduced the “graphico/statistical” method of labor analysis; it was recommended that the clinician make a graph of dilation of the uterine cervix and station of the fetal presenting part versus time.32 An idealized labor is presented in Fig.1. Dilation extends from 0 to 10 cm, and station extends from either −3 to +3 finger breadths or −5 to +5 cm, depending on the method used for station. We recommend the −5 to +5 cm system for station.18 A graphical presentation of labor greatly facilitates the diagnosis of arrest and protraction disorders (Fig. 2). At the time of each examination, the physician or nurse in attendance should record the time, dilation, and station on the labor graph. Constructing the graph after labor has been completed is not helpful. Fig 1: An idealized labor pattern. The normal patterns of cervical dilation (solid line) and descent (broken line) as they are traced against elapsed time in labor. The distinctive phases of the first stage are shown. The active phase comprises the interval from the onset of the acceleration phase to the beginning of the second stage. Fig 2: Graphic representation of disorders of the functional divisions of labor. Cervical dilation and fetal station as the ordinate and time as the abscissa. At the top, the normal dilation curve is compared with the preparatory division abnormality of prolonged latent phase (1). The middle group presents the protraction disorders of the dilational division—protracted active-phase dilation (2) and protracted descent (3). At the bottom are the pathologic states of the pelvic division, including prolonged deceleration phase (4), secondary arrest of dilation (5), arrest of descent (6), and failure of descent (7). The broken portions of the curves represent mean normal patterns; the unbroken portions represent abnormal patterns. Onset of labor is considered 0 time on the labor graph and is defined as the time of onset of regular uterine contractions. Because the patient is generally at home at the beginning of contractions, the onset of labor (latent phase) is based on her estimate. At the beginning of labor for nulliparas and multiparas, the usual cervical dilation is approximately 2 cm, although with premature rupture of the membranes, sometimes the cervix may be closed. Some multiparas may begin labor, however, with cervical dilations of 4–5 cm. The station of the fetal presenting part tends to be lower in the pelvis in nulliparas than in multiparas. Although it often is said that nulliparas should have an engaged fetal head at the onset of labor, this is frequently not the case. On average, the presenting part can be expected to be a −1 station in the nullipara at labor onset compared with −1 to −2, or even slightly higher, in the multipara. When the patient has been admitted in labor, the question arises as to the appropriate interval for subsequent examinations. This is a controversial subject. Some authorities believe that repeated vaginal examination increases the risk for postpartum endometritis.41 Other authorities, using multivariate analyses, have suggested that the problem is not repeated examination but rather prolonged labor, which in turn leads to more examinations.42 We recommend examinations approximately every 2 hours during latent phase, with examinations each hour later in active phase.40 This general approach, with appropriate documentation of the examinations, helps ensure that developing labor abnormalities are neither missed nor neglected. An increased risk for infection has not been documented over many thousands of deliveries managed with this approach. In our experience, clinicians often resist making labor graphs during the labor progress, despite service policy. In response to this resistance, an approach has been developed that allows a similar decision process without the necessity of making a labor graph. All that is necessary is that the clinician determines whether labor is latent or active and remembers some simple numeric rules. If the cervix is less than 4 cm, and dilation is greater than l cm/h in the nullipara and 1.5 cm/h in the multipara, the patient should be considered to be in latent phase. The average slope of dilation in latent phase is less than 0.6 cm/h. The patient is in active phase if cervical dilation is greater than 5 cm or the cervix is dilating at a rate of at least 1 cm/hr in the nullipara and 1.5 cm/h in the multipara. The two definitions for latent and active phases are mutually exclusive but are not exhaustive. Intermediate dilations (i.e., from 4 to 5 cm) and slopes yield an unclear picture as to the phase of labor. Often these patients are entering active from latent phase (i.e., they are in acceleration phase). The acceleration phase is followed by the phase of maximum slope, in which there is rapid cervical dilation. Finally, a dilation of 9–10 cm (full dilation) is considered the deceleration phase. The descent of the fetal presenting part may remain latent until 9 cm of dilation has been attained, when descent should be proceeding actively (i.e., the deceleration phase is an acceleration phase in terms of descent). The second stage of labor begins on complete dilation. 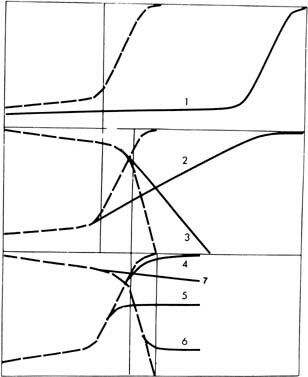 Classically, six dysfunctional labor patterns are defined, including (1) prolonged latent phase, (2) protracted active phase dilation, (3) secondary arrest of dilation, (4) prolonged deceleration phase, (5) protracted descent, and (6) arrest of descent (see Fig. 2). Some authorities would add to this list the additional diagnoses of prolonged acceleration phase and failure to descend as an abnormality separate from arrest of descent. Precipitous labor also sometimes is added to the list, the usual definition being a total labor duration of less than 3 hours. From a functional perspective, however, there are only two ways in which labor can be abnormal: Dilation and descent may be either protracted or arrested. Latent phase begins with regular contractions that efface and dilate the cervix and ends with the onset of active labor. The length of latent phase is a function of several factors. Generally, latent phase is inversely related to cervical dilation at the time of onset of labor. Similarly the lower in the pelvis the fetal presenting part is at the onset of labor, the shorter the latent phase. A potential for producing prolonged latent phase with sedation must be remembered. In most sedated patients, labor resumes when sedation has worn off. Based on standard criteria, prolonged latent phase is diagnosed after 21 hours in the nullipara or 14 hours in the multipara.32 This disorder is relatively rare, occurring in 3–4% of labors.43, 44 In the absence of sedation and analgesia, such long intervals tend to be unacceptable to patients and can result in maternal exhaustion. One approach is to evaluate the patient carefully as 12 hours in latent phase approaches. If there has been interval cervical effacement and dilation or fetal descent (indicating that the patient is not in false labor), a reasonable approach is to begin oxytocin augmentation. In such cases, we recommend starting at a low dose (1–2 mU/min), with increases of 1–2 mU/min every 30 minutes. An oxytocin infusion of 16 mU/min or less is successful in bringing the patient into active labor in approximately 9 out of 10 cases. Typically an oxytocin infusion of 4–6 mU/min is usually sufficient. When studied epidemiologically, prolonged latent phase seems to be a relatively benign labor disorder. It is associated with a 2.5-fold increase in risk for primary cesarean section, however.45 It previously was reported that the fetus tolerates prolonged latent phase well, without an increase in morbidity or mortality. For nulliparas, protracted active phase dilation should be diagnosed when the dilation rate is less than 1 cm/h. For the multipara, the lower limit of normal is 1.5 cm/h. Based on Friedman’s original definition,32 a limit for nulliparas of 1.2 cm/h might be used, but in our experience, such a limit may be overly sensitive and is more difficult to remember than the 1 cm/h limit. In addition, the 1 cm/hr limit has been validated by Philpott and Castle,46 who proposed an alternative and simple method of graphing labor progress (Fig. 3). A common error is diagnosing protracted active phase when the patient is really in the latent phase of labor. Because of the changes in the increased use of epidural anesthesia and its “slowing effect,” Rouse and colleagues47 reported that the fifth percentile rate may be lower for nulliparas and parous women (0.5 cm/h). Another potential reason for lower rate of dilation was that Friedman reported on patients with “normal labor” who did not require oxytocin, whereas Rouse described patients with “abnormal labor” who required augmentation. Protracted active phase dilation is a common dysfunctional labor pattern. It seems to be associated with mild cephalopelvic disproportion. Clinical experience with intrauterine pressure catheters suggests that many cases of protracted active phase dilation might have been termed primary uterine inertia or hypertonic uterine inertia previously, suggesting some type of uterine dysfunction. There also may be an iatrogenic contribution to this labor abnormality, with the possibility that supine position may decrease uterine contractility, leading to slowed cervical dilation. Also, although active labor is relatively insensitive to analgesia, the use of narcotics may be associated in some cases with precipitating slow dilation in active phase. Early epidural anesthesia, particularly if the station of the presenting part is higher than −1, also is associated with an increased risk for this labor abnormality. Sharma and coworkers48 compared labor progress between patients with epidural anesthesia and patients with intravenous narcotics and noted a 1-hour increase in the duration of the first stage of labor. The occurrence of protracted active phase dilation should also be considered an important risk for later labor dysfunction. The risk for subsequent arrest of dilation or descent, prolonged deceleration phase, and protracted descent may be increased 2.5-fold to 8-fold in nulliparas and multiparas. As a clinical rule of thumb, later problems should be anticipated when active labor begins more slowly than normal. Despite its relatively common occurrence, there are limited data for the use of oxytocin in treating protracted dilation. There is substantial evidence, however, that the “active management of labor” constitutes an efficacious and safe approach. In a 1988 study by Akoury and colleagues,49 552 nulliparas with singleton pregnancies who had established labor and amniotomy were compared with 533 previously delivered similar patients. The study group received amniotomy and oxytocin augmentation, up to 40 mU/min for dilation rates less than 1 cm/h. Results of this historically controlled study indicated that in the actively managed group, the frequency of labor lasting greater than 12 hours was reduced almost threefold from 20% to 7%. The cesarean birth rate was decreased to one-third of the previous rate, from 13% to 4.3%. Forceps operations were decreased from 29% to 19.4%. These differences in operative delivery rates were not associated with any increase in perinatal morbidity or mortality in the study group. Although the cause of protraction is unclear, a reasonable approach includes early detection of abnormal labor progress in active phase, institution of fetal monitoring, lateral positioning, and careful use of oxytocin. Just as causative factors for protracted active phase dilation are unclear, so is the most appropriate management. Considering that there may be some association between mild disproportion and malposition (i.e., occiput posterior and occiput transverse), this can be a trying situation for the patient and the physician. A conservative approach is to avoid unnecessary sedation and anesthesia. Secondary arrest of dilation is diagnosed when there has been no change in cervical dilation for at least 2 hours. This time criterion is the same for nulliparas and multiparas and is based in part on the certainty with which cervical dilation can be determined on digital examination. Secondary arrest, which occurs in 5–10% of labors in most series, is more frequent with term than preterm and with larger than smaller fetuses. This abnormality occurs more frequently than prolonged latent phase but less frequently than protracted active-phase dilation. It has been recognized as being the most severe of dilation abnormalities because of its association with increased fetal morbidity and mortality and with a considerably increased risk of cesarean birth. There is a well-recognized relationship of secondary arrest with fetopelvic disproportion. It has been suggested that the diagnosis not be made unless labor is active, the cervix is dilated greater than 4 cm, and there has been 2 hours of no cervical change with 200 Montevideo units or more per 10-minute interval.13 The development of secondary arrest is associated statistically with the occurrence of persistent malposition (i.e., persistent occiput posterior and persistent occiput transverse). It is unclear, however, whether the associated malposition is a result or cause of the arrest disorder. There is a fivefold increase in the risk for secondary arrest of dilation in nulliparous labors complicated by protracted active phase dilation, with the eightfold increase seen in such multiparous labors. This increase suggests a possible causative role for “uterine inertia.” This situation has not been well studied, however, either electrophysiologically or mechanically. Compared with the available information concerning cause, there are many studies with well-defined results concerning the appropriate treatment of secondary arrest of dilation. This secondary arrest of dilation is the classic indication for “trial of labor”; this includes diagnosis of failure to progress and oxytocin augmentation of labor for patients with an arrest but without evidence of disproportion. Friedman32 reported a primary section rate of approximately 40% after secondary arrest of dilation. He suggested that given appropriate management, this rate might be lowered, an observation that has been validated by subsequent studies. In a study of 255 primary cesarean and 2362 vaginal deliveries, Sokol and colleagues45 reported a primary cesarean section rate of 25.5% after secondary arrest of dilation. This rate represented a 2.6-fold increase. Bottoms and associates50 studied 4573 singleton, vertex, spontaneous labors. In this study, arrest disorders occurred in 593 (11%) labors. Patients with arrest disorders were managed by a “conservative” medical protocol including ambulation, amniotomy, and oxytocin. It was found that approximately 50% of the arrests resolved spontaneously, with the other 50% requiring oxytocin stimulation. Overall, 83% of the women delivered spontaneously or with low forceps. The midforceps rate was increased fivefold to approximately 4%. The cesarean rate also was increased fivefold to approximately 13%. In this series, there was no perinatal mortality and no increase in low Apgar scores at 5 minutes (1.5%). Neonatal morbidity was similar among cases treated conservatively compared with neonates delivered via cesarean section. It was concluded that conservative management with oxytocin augmentation was capable of producing maternal and infant outcomes with an increased, but still low, cesarean birth rate. If there is evidence of fetal distress, the fetus may be evaluated biochemically, but often cesarean delivery is necessary. If labor is not progressing normally within 2–3 hours after the beginning of the oxytocin augmentation, cesarean section may be indicated. The need for cesarean delivery is relatively infrequent, however. Studies by Rouse et al.51 have suggested that the likelihood of vaginal delivery can be improved by waiting for up to 4 hours of adequate contractions with the administration of oxytocin. In his studies, more than 60% of patients with arrest of active phase for more than 2 hours eventually achieved a vaginal delivery. In his studies, however, there was an increased risk of shoulder dystocia, but none were accompanied by brachial plexus palsies.24, 47, 51 The clinician may expect at least three of four patients with this complication to have a successful vaginal delivery. It seems that immediate cesarean delivery for secondary arrest is unwarranted. Good outcomes can be obtained by way of conservative (medical) management. 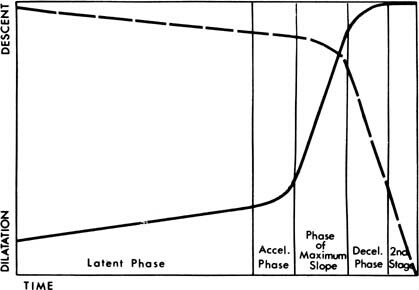 The deceleration phase is the third phase of active labor, after the phase of maximum slope. The onset of deceleration phase begins at 9 cm for nulliparous and multiparous labor. Active descent should start by the beginning of deceleration phase, although in many labors active descent begins earlier in active labor. Engagement that does not occur by the beginning of deceleration phase (i.e., 9 cm) in nulliparas and by the end of deceleration phase in multiparas is abnormal. Prolonged deceleration phase requires at least 3 hours for diagnosis in nulliparous labor and 1 hour for diagnosis in multiparous labor. Because descent should be active by this time in normal labor and because the intervals for diagnosis of descent abnormalities are shorter than those necessary for the diagnosis of prolonged deceleration phase, the clinician’s attention should focus more on descent than on dilation at this time in labor. If engagement has not occurred by 9 cm of dilation, the likelihood of a second-stage abnormality is increased. Prolonged deceleration phase is strongly associated with descent disorders. Typically, prolonged deceleration phase as a labor abnormality seems most closely related to secondary arrest. Careful augmentation of labor with oxytocin, as per the protocol described earlier, is often warranted. Prolonged deceleration phase is relatively rare, occurring in only 1–3% of labors. Clinical experience suggests such cases are associated frequently with persistent occiput transverse or posterior or some pelvic abnormality frequently detectable on clinical pelvimetry. Patients with this abnormality sometimes develop cervical edema with considerable molding of the fetal skull. Fetal heart rate decelerations occur with increased frequency in this situation, leading to a temptation to apply forceps through an almost but still incompletely dilated cervix. This impulse must be resisted because there is a substantial chance of severe fetal and maternal trauma. Onset of the second stage of labor occurs with full dilation of the cervix. On average, the median duration of the unintervened second stage of labor is estimated to last 1 hour in nulliparas and 15 minutes in multiparas. “Clinical limits” for second-stage durations at which time the clinician should become concerned and anticipate problems with delivery have been proposed. For nulliparas, this clinical limit is 2 hours, and for multiparas, it is 1 hour, but the clinician should become concerned when the second stage exceeds 45 minutes. These limits are not intended to indicate that delivery must be achieved by these times. Before the availability of electronic fetal monitoring, it was believed by many clinicians that a maximum of 2 hours of the second stage was safe for the fetus. This belief was based on epidemiologic evidence that fetal morbidity and mortality in nulliparas was increased when the second stage was at least 2.5 hours. An overview of the literature strongly suggests that the simple use of time limits for second stage no longer constitutes an appropriate approach to management of the second stage of labor. More detailed maternal/fetal assessment with carefully considered intervention seems optimal. This assessment may include fetal scalp blood sampling, which is usually technically easiest to perform during the second stage of labor. Close observation, carefully considered intervention, and technically competent execution of the chosen intervention (i.e., electronic fetal monitoring, fetal scalp blood sampling, forceps, vacuum extraction, or cesarean delivery) are necessary to ensure the best maternal/fetal outcome possible in the face of abnormalities that may develop during the second stage of labor. Protracted descent should be diagnosed in nulliparous labor when descent is proceeding at less than l cm/h and in multiparous labor when descent is proceeding at less than 2 cm/h. Although it is true that station of the fetal presenting part is more difficult to estimate reliably than is dilation, it is possible to make this diagnosis within 1 hour for the nullipara and within 0.5 hour for the multipara. A careful balance should be sought between overdiagnosis and failure to diagnose protracted descent as promptly as possible because treatment may entail substantial intervention. The cause of protracted descent often includes malposition and relatively mild degrees of fetopelvic disproportion; absolute fetopelvic disproportion is unusual. Slow descent frequently is associated with the use of epidural anesthesia. Protracted descent requires skillful and attentive management. It frequently is preceded by other dysfunctional labor patterns, which may constitute evidence of substantial disproportion or uterine dysfunction or both. Under such circumstances, whether or not it is reasonable to attempt oxytocin stimulation is an open question. The answer must be rendered on a case-by-case basis. It is not unreasonable to suggest that if protracted descent occurs in a labor already complicated by preceding dysfunctional labor patterns in the presence of oxytocin augmentation, perhaps it would be best to proceed with cesarean delivery. If the patient also has an epidural anesthetic or voluntary pushing appears inadequate, effective coaching and allowing more time may be successful. Although controversial, many clinicians decrease or discontinue the epidural anesthetic to increase the effectiveness of the parturient’s pushing. Other clinicians believe that having the patient in an upright position allows the most effective voluntary pushing and has the benefit of gravity. However, the literature and clinical experience are inconsistent on these points. Appropriate management for protracted descent, which has been associated with worsened infant outcome, includes institution of electronic fetal monitoring. Fetal monitoring often is discontinued when the patient is moved from the labor to the delivery room. Because fetal monitoring just before delivery relates most closely to neonatal status, the generation of a paper tracing in the delivery room for documentation is important. If protracted descent occurs in a labor that has been otherwise normal, it is probably reasonable to augment with oxytocin. In the nullipara, if full cervical dilation has not been achieved and there is a persistent anterior cervical lip that becomes edematous, the chance of atraumatic vaginal delivery is markedly reduced. In the multipara, it is sometimes possible to support the anterior lip and have the patient bear down, allowing the achievement of full dilation and significant descent. This latter approach seems particularly effective if preceding labor has been normal and there is a good response to oxytocin stimulation. Protracted descent frequently is associated with the presence of a persistent occiput posterior. Previously the management of occiput posterior commonly included forceps rotation. Direct occiput posterior delivery and manual rotation constitute appropriate and potentially less traumatic approaches, however. Normal spontaneous vaginal delivery and low forceps procedures occur in approximately half of cases complicated by protracted descent. The diagnosis of arrest of descent should be made when descent has stopped entirely for at least 1 hour in the nullipara and 0.5 hour in the multipara. It frequently is preceded by and has the same causative factors as protracted descent. When arrest of descent has not been preceded by other dysfunctional labor patterns, experience suggests that, similar to secondary arrest of dilation, it is extremely sensitive to oxytocin augmentation. Low-dose intravenous oxytocin frequently is associated with spontaneous vaginal delivery. As with the case of augmentation for other labor abnormalities, electronic monitoring is appropriate. When arrest of descent is preceded by other dysfunctional labor patterns, the situation is similar to that regarding protracted descent. If the patient already is receiving oxytocin augmentation or full dilation has not been attained, proceeding to cesarean section is probably the best approach. Sometimes vaginal birth may be attained, but great care must be taken when attempting delivery by midforceps or vacuum extraction under these circumstances. Before undertaking an operative vaginal delivery, it is crucial to evaluate the maternal outlet carefully, particularly in terms of the angle of the pubic arch and the distance between the ischial tuberosities. Also, the possibility of macrosomia and shoulder dystocia should be entertained. The situation in which the vertex is below +1 cm, but descent has ceased is not rare. The delivery of such a deeply engaged fetal head at cesarean section commonly results in lacerations of the cervix and lower uterus. The possibility of operative vaginal delivery continues to warrant consideration in such cases. Most studies of the third stage of labor have been confounded by manual removal of the placenta. In a study of 45,852 gravidas, Dombrowski and coworkers52 used life-tablele analysis to control for the confounding effects of manual placenta removal. This analysis revealed that manual removal of placentas shortened the apparent duration of third stage of labor, especially among preterm deliveries (Table 3). Premature delivery was a significant risk factor for complications of the third stage of labor, such as retained placenta (undelivered greater than 30 minutes), manual removal, and hemorrhage (estimated blood loss greater than 500 mL). The frequency of hemorrhage peaks by 40 minutes regardless of gestational age. This peak may be because manual placental removal was accomplished for patients with active uterine bleeding, although manual removal per se may increase blood loss in some cases. On the basis of these data, it would be difficult to justify routine manual removal of the placenta before 10 minutes for any gestational age. We believe that manual removal of the placenta must be balanced against the risk for increased maternal trauma and hemorrhage. It is unknown whether the risk of hemorrhage or the amount of blood loss can be decreased by manual placental removal; the optimal time for intervention can be determined only by a prospective clinical trial. There is no known test that can differentiate normal from abnormal labor. The diagnosis and optimal management of abnormal labor combine science and art. The management of abnormal labor taxes one’s clinical skills under the best of circumstances. Such cases are complicated by patients who demand and expect a painless and fast delivery resulting in a perfect infant. The possibility of malpractice litigation further complicates the issues—a thorough documentation of events, especially in the face of maloccurrence, cannot be stressed enough. A key to the optimal management of abnormal labor remains intensive observation with conservative, well-chosen, and carefully executed interventions. Utah Medical Products, I. Intrauterine pressure catheters - Intran PLUS IUPCs. 1998-2008 2008 [cited 2008; Available from: http://www.utahmed.com/intran.htm. Clinical Innovations. Clinical Innovations - Koala IUPC. 2003 [cited 2008; Available from: http://www.clinicalinnovations.com/koala.htm. Greenberg MB, et al: Does length of labor vary by maternal age? Am J Obstet Gynecol 2007; 197: 428.e1-7.